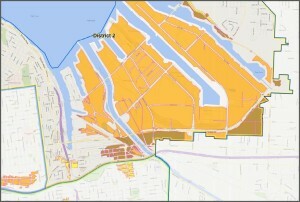 The Recreational Marijuana Map provides the locations where I-502 (Recreational Marijuana production, processing, or retail sale) are permitted within the City of Tacoma. While the map is a great tool that can assist marijuana businesses to find locations, it should be used with some discretion. Many variables and factors can determine whether a recreational marijuana use will be in a permissible location. Further, some areas on the map that do not show up may be affected by a sensitive uses that was mis-categorized in the analysis or was recently vacated. It is up to all businesses to verify their location is acceptable independently. The City of Tacoma also recommends that recreational marijuana related businesses contact the Washington State Liquor Control Board (WSLCB) to verify that their location is acceptable.